When I picked this up I thought it was going to be amazing, but unfortunately, the glitter wasn't too dense, and it just didn't wow me. Awww, phooey! This is one of my favorite glitters! It does end up looking quite a bit more dense at 2 coats - have you tried that? I haven't, I was so dissapointed at the first coat, that I didn't even bother, but thank you! I will try it. Hi! 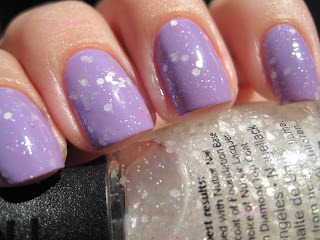 thank you, I didn't know white glitter even existed until I saw Lynnderella's Snow Angel, I really think I have been spoiled with Lynn's dense nail polish and now everything looks too sparce, ha ha! really? awww thank you, now I feel like I should give it an other try. I need to learn to appreciate "subtle", it's like holographic nail polish, I like the flashy ones! Thanks Kelly, I am going to try the two (or three) coats. I think it looks amazing :) Would def do 2 coats though. Thank you! I will try that for sure.